They are the three fundamental forces of narrative. 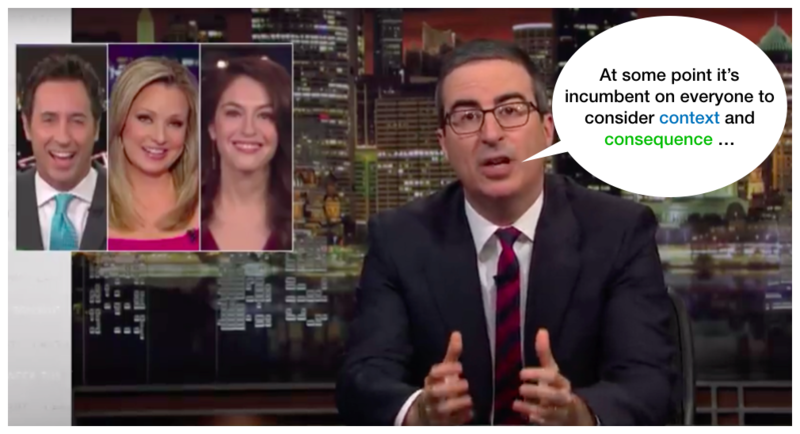 Last night John Oliver, talking about a specific case of social media shaming, said, “ … but, at some point, it’s incumbent on everyone to consider both CONTEXT and CONSEQUENCE if you’re going to pile on in a shaming.” He’s talking about the ABT dynamic. He’s addressing what happens if all you present is the CONTRADICTION — the “but.” He grasps the ABT Framework. It’s the same thing I pointed out about Twitter in 2015 — presenting only contradiction ends up being non-narrative and won’t work in the long run. Such are the brainless inefficiencies of a short attention-spanned society. JOHN OLIVER TALKS ABT AND SOCIAL MEDIA. In the second appendix of the Houston book I made the prediction that Twitter wouldn’t last long at 140 characters. My reasoning for that was 140 characters was too short to allow all three forces, and instead was selecting for mostly the most attention-grabbing element — contradiction. My prediction came true in 2017 when Twitter shifted to 280 characters. But, at some point, it’s incumbent on everyone to consider both CONTEXT and CONSEQUENCE if you’re going to pile on in a shaming. Truly effective communication, to have a lasting impact and not produce a society of lemmings chasing one source of contradiction after another, needs to make time for all three elements. This is the inefficient brainlessness of social media — it’s largely non-narrative. You can’t do that and expect to communicate well. Our brains need all three elements of narrative to make proper sense of things. They were designed thousands of years ago and are still the rate-limiting element for communication. This entry was posted in ARTICLES, NEWS, THOUGHTS and tagged consequence, context, John Oliver, shaming by Randy Olson. Bookmark the permalink.